The Ensemble in LITTLE WOMEN. Photo by Rich Ryan. 150 years ago, Louisa May Alcott wrote a book called Little Women about four sisters struggling with the hardships of living in Massachusetts during the Civil War. That book has since gone on to inspire countless film and theater adaptations and is still much loved for its messages of strength, hope, and the sometimes impossible task of simply being yourself. 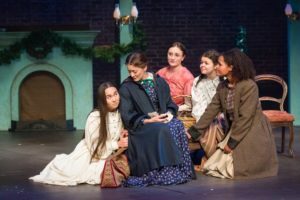 The Jungle Theater’s new production of Little Women, running from September 15th to October 21st, takes these messages and vividly portrays them onstage. Writer Kate Hamill was commissioned by the Jungle Theater to breath new life into the book for a premiere stage adaption, and with artistic director Sarah Rasmussen at the helm of the production, the show is as heartfelt and inspirational as its source material. Rasmussen, in discussing why they chose Little Women, said that it afforded the Jungle the opportunity to present something new and exciting that holds aloft Alcott’s original themes. Hamill’s adaptation does this exceptionally well but also finds a way to make a story about women in the middle 1800’s living at a time when the nation was divided relatable to the challenges of today. The story follows the March women, matron Marnie, played by Christina Baldwin, and her four “Little Women”, Amy, Beth, Jo, and Meg as they go from adolescence to adulthood. Jo, played by C. Michael Menge is the tomboy of the family with aspirations to be a great writer. Amy, played by Megan Burns, is the childish one who just wants the finer things in society and who is constantly at odds with Jo. Meg, played by Christine Webber, is the oldest of the four and Beth, played by Isabella Star Lablanc, is the shy and gentle middle child. The set of Little Women, designed by Chelsea M. Warren is simplistic to mirror the sparse and poor surroundings of the March women in their Massachusetts home. The use of Civil War-era quilts tacked around the stage and pulled across the stage as a makeshift curtain helps keep the audience firmly in the period of the play. Warren also incorporated a turntable stage that was used for transitions throughout the play, and while some of the choreography on the turntable itself translated as a bit clumsy and heavy in its execution, it did little to detract from the overall polished look of the piece. The turntable is used to genius effect in two scenes to help emphasize the chaos and heart-wrenching moments when one of the sisters gets sick. Rebecca Bernstein’s costume designs are also simple and perfect for the period. Menge was outfitted with pants for the majority of the show, which highlighted Jo’s boyish personality perfectly. Menge livens up the stage within the first few minutes, playing Jo with ceaseless energy and a passionate optimism that you can’t help but cheer for. In the first scene, Jo (Menge) shows just how different they are from their ladylike sisters. Jo parades around the stage in a fake mustache and even jumps on a table, declaring their dreams of being a great writer while the other sisters roll their eyes or smile at Jo’s boisterousness. If Menge carries the show through their zealousness, ceaseless energy, and determination, it’s LaBlanc, playing the middle sister Beth, that provides the heart and quiet strength of the play. Even though Beth is characteristically shy and soft-spoken, LeBlanc is never lost to the background in the midst of the strong personalities of her sisters. All in all, Little Women is filled with emotion, love, loss and will take your heartstrings captive within the first few scenes, only to finally release them at the final curtain.